Guys should consider themselves lucky when it comes to weddings. If you're a groomsman, there isn't much involved other than maybe get your haircut, look nice and shower the day of the wedding, don't forget your tie, and show up to party at the bachelor party. For a lady as a bridesmaid, there're the dress fittings (yes multiple) for the party and the bride, wedding showers, helping planning the wedding itself including food, decorations, flowers, linens, music, location, and don't forget the ever important bachelorette party. All this to wear a (usually) semi-hideous dress you only wear once to support your friend. Yes, it's tedious, but you do because you love them. 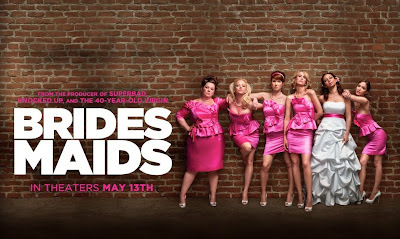 BRIDESMAIDS centers around love-deprived Kriten Wiig, a failed baker because of the economy, as she tries handling maid of honor duties to Maya Rudolph's wedding whilst juggling a good guy in her life who tries to encourage her to bake again, a bad guy in her life who kicks her out of his bed every night, horrible job selling rings at a jewelery store, weird roommates who go through her things, and the crazy personalities of the other bridesmaids, including Rose Byrne who is the perfect bridesmaid who knows all the right people to get into all the best places and is trying to weasel her way into Rudolph's good graces as her new best friend. Wiig has a thin line to tread here. On the one hand, she has to play the loyal best friend fulfilling her maid of honor duties; while on the flip side, she's a tad bit jealous that her friend is getting married and she pretty much has no prospects, and she's in a going-nowhere-fast, booty-call relationship with Jon Hamm in his most douchiest role to date. Any lady who has been the maid instead of matron of honor knows this jealously situation all too well. Wiig handles it with ease with being supporting yet vulnerable and sympathetic. Her life is falling apart and hits bottom a few times, yet always puts on a stiff upper lip for her maid of honor duties. In the midst of all this, she forms a rather sweet relationship with local cop, Rhodes played by Chris O'Dowd. Rhodes is sweet, not overtly attractive but cute, but most of all, he's normal. He's not a 'good guy' caricature seen in most comedies. His calm demeanor contrasts perfectly to Wiig's nuances and insecurities, and their growth of their relationship is very natural and believable, including a very poignant scene where they run into each other in the wee hours of the morning and share a wonderful conversation while eating carrots. Another testament to Wiig's writing is the character of Megan, the bride's soon-to-be sister-in-law, played by the fearless Melissa McCarthy. Not having any background of McCarthy from Gilmore Girls, where I hear she's fabulous, I figured, from the previews, I would be able to write her off as the female Zach Galifianakis with her saying crude lines at inappropriate times, slapstick physical comedy, and endless fart jokes. Oh, and all those things happen in the movie; however, she is an actual character with real depth and likability. She's not just the fat one; she's the one you underestimate. Then there's the ever wonderful, in her best role to date, Maya Rudolph as the blushing bride. As any bride understands, the bridesmaids are from all parts of your life from old friends, to coworkers, to relatives. These ladies personalities always work independently, but there's trepidation when bringing them together for such an occasion. Through the hilarity of each escalating situation (from a rather interesting flight to Vegas to a disastrous dress fitting), Rudolph strikes a balance of being a semi-bridezilla who wants everything to be perfect to being an understanding friend. A hard task that could have easily been botched by anyone else. Let's be clear. This movie will redefine "chick-flick". Yes, in the terms that females will flock to see this opening weekend with their BFFs, it is a chick-flick. However, this movie has redefined that very narrow description. Even though there is romance in the story, it's not the Heigl rom-com formula with a race to stop someone at the altar or airport. As a writer, Wiig has developed a comedy where her characters can not only be hilarious and smart but can play in the boy's comedy world and be down right vulgar. It's refreshing and fun to watch. Recently, comedies nowadays, like horror movies, have become so formulaic with cheap, recycled jokes. 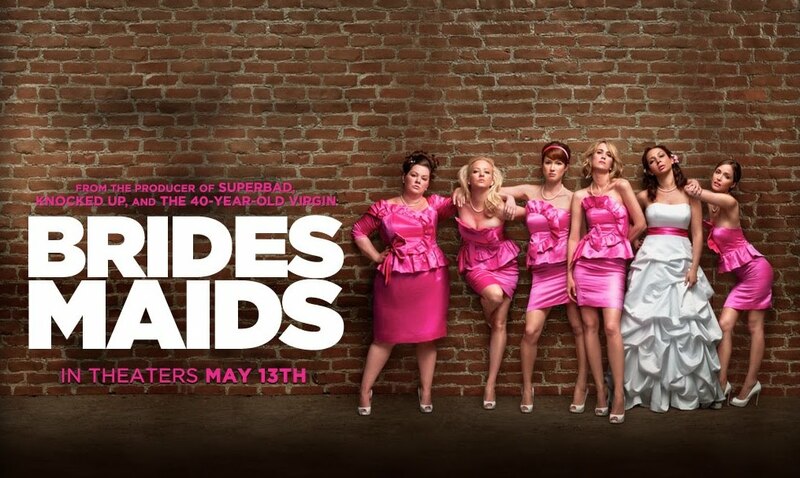 BRIDESMAIDS smashes that formula with a truly great ensemble comedy. Yes, the main characters are all women, but that's a moot point. This movie is down right funny and extremely smart. Wiig and company have rejuvenated the formula for an ensemble comedy with witty dialogue, some crude humor and a lot of heart. And who knew carrots could be romantic?